I was planning on saving this post until I knew the results of the auditions, however, one slip of the finger and I accidentally published and Google Reader left the fragment posted (grr). I was immediately contacted by several of you for the remaining details. So, for all of you inquiring minds - here you go. When friends of mine go on and on about how they botched an audition, I think to myself, "You are ridiculously talented, there is no way you could botch an audition so badly that they can't see through the mistake and into your talent." I could not wrap my brain around this concept. Well, I am here to tell you that I now get it. Don't worry - there is a positive side to all of this! Remember how I like to take the good and run with it and how a good story is always worth it? 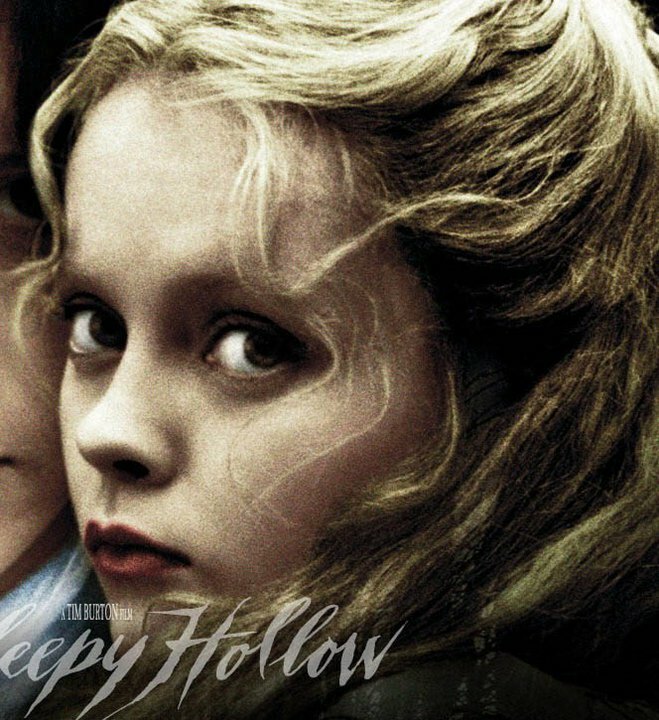 Sleepy Hollow is not just any show. Sleepy Hollow is written by Jim Christian, theater director at Weber State University and winner of the Kennedy Center American College Theater Festival award. Guess who was conducting auditions and is directing the show? Jim Christian. 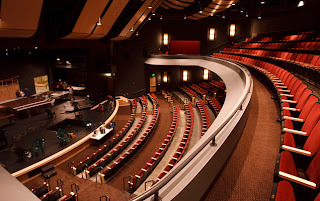 For my initial audition on Saturday August 13, I sang "Once Upon a Dream" from Jekyll and Hyde. Hey, they requested Wildhorn, so I delivered a song with which I would normally never audition. Needless to say, I was thrilled (!!!) to receive the e-mail with the great news that they were considering me for three roles (ranging in age 14 years), including the leading lady, Katrina Van Tassel. 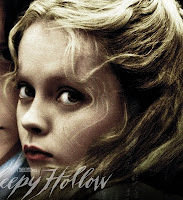 I do happen look like Katrina from Tim Burton's crazy version of Sleepy Hollow, don't you think? I expected the first night of callbacks to be crazy. Even in the most whittled-down of callbacks I've attended, there are at least a dozen young ladies fighting for the role. Imagine my surprise and joy when I found myself in the company of five other amazingly talented stars. How did I get into this exclusive group? I quickly discovered that I was clearly the only one not classically trained. Which is super awesome (or not) for a song in consistently high soprano. In spite of this, high soprano notes have won me several roles. Typically, the auditors and other singers are in awe of my soaring melodies. I felt confident in the song. I got up to sing. I'd say I sang, except that nothing came out for the first 8 notes. By nothing, I mean that the notes came out in barely a whisper. What the? This has never ever ever happened to me before! I continued to sing, but instead of trying to fake classical training I have never had, I just belted as much as I could and then flipped to head voice. But once you start off on the wrong foot, your nerves tend to get the better of you. I had to hold the music with both hands because I was shaking so badly. I guess the good news is that I really stood out:-) Ha. I have honestly, before now, never felt embarrassed at an audition. I've never even felt as if I messed up. Heck, I usually 1,000% rock my auditions. I usually can confidently say I'm one of the best and know a role is coming my way. But I blew it. And I knew it. I felt I redeemed myself with the acting portion. I'll even go so far as to say I felt the tops about my acting, giving myself the chills a little bit. I'll go even further and say that might have been the best cold read I've ever had. But in a musical, no amount of acting will make up for terrible (or non-existent) singing. I had a dream (nightmare?) Wednesday night that the director asked me to not even come back for the next night of auditions to which I had already been invited. All day Thursday, all I could think about was redeeming myself - going back in that room and knocking their socks off! I walked into that room already feeling confident, at home and amongst friends, as the ladies from the previous night were all there again. We also found ourselves in the company of about 6-8 additional women and about a dozen men. We first learned a 4-part harmony song and I took the soprano, a little fearful considering my experiences of the previous night. All the other groups were pretty balanced, but I was quite good at outsinging the other three in mine. For the record, and for all of you non-singers, singing louder than everyone else when you are supposed to be blending is not the best thing to be doing. They were all even following my tempo, which is a weird feeling when you realize you are leading. How is it that one night nothing comes out and the next I'm explosively too loud? Alas, I felt pretty good about it. Next, we learned a six-part harmony. My heart began to palpitate a little as the music is gorgeous, yet intricately difficult. Ooo...I'm so excited thinking back on this music! I can't wait until there is a CD someday for me to listen to. Really, folks, this is the perfect Halloween musical! Okay, back to six-part harmony. I learned all three women's parts to figure out which one to sing. Our lovely music director, Julie, told us to pick the part of the character we were called back for. I had been called back for all three, so I picked the one that suited my range the most after learning all of them and getting myself confuzzled. All in all, when my turn with my group came, I felt pretty okay about it all and rather impressed myself. The third task of the evening was to learn a solo part in a song that is the telling of ghost stories. Oh how I loved this part! Every note fell right into my sweet belting range and they even told us to sing in a brassier tone. Be still my heart! This was my chance for redemption! I was clearly the only lady there who preferred belting over the classical style. I picked up on the song very quickly and felt I even had character behind it. I jumped at the opportunity to perform second, not wanting anyone to use the ideas I had for the song. I was into it, telling this ghost story as if a child around a campfire and the room was enraptured silent with suspense. Then, I turned the page only to realize I'd turned to the wrong page. For the love! I hummed a line while the pianist vamped and then I just jumped back in where I thought she was. Unfortunately, my gripping story-telling then turned back into methodical singing of notes because I didn't want to get so wrapped up in acting that I made another mistake. I was given the perfect chance to prove what I've got, to show them they need to cast me and I turned a page wrong - something that is no indication of performing talent at all. Really, you just have to laugh about it. By the end, of the dozen or so people, I bet at least half of us made some similar error and we all learned to have a good laugh at our own expenses. Life happens. What I really love about working with Jim and Julie is that you can tell they can see past those mistakes. They heard you hit the note 5 times, just because you didn't hit it once doesn't ruin your chances. The conclusion of the evening for me, and the other younger looking ladies, was the acting. Jim picked a scene where there are eight characters interacting and had us read together, regardless of whether or not the part we were reading was a part we were auditioning for. That saved a lot of time, as we only had to run the scene three times. I loved this portion of the audition. Really, he just needed to see if people can act and become another character. My favorite was a woman who had to be late 40s or early 50s reading for the part of a 15-year old. I also got to read as the 15-year old, perhaps because I jumped up and exuberantly offered myself up for that part, but I can do 15 and boy did I ever. I felt like my character was Jim Carrey amongst a group of Shakespearean actors. There is no question left if I can act in an animated way, I'll tell you that. When all is said and done, I have come to the conclusion there is really only one part I may still be being considered for - a 19-year old bubbly flirt who sings in a brassy belt the whole show - umm...hello I am perfect for this. But there were four other adorable women who would be brilliant in the part, and only two of them are going to get cast. And that's if there is no one being considered that wasn't able to make the callback. If this were based on acting alone, I'd have a part nailed. But my singing. Oh my singing. This is very ironic to me considering that my singing is usually my strongest suit. I have no idea what happened. I hope to be involved in the production in some way. I honestly have no idea what my odds are and writing about an audition before I know about the results is a never-before-been-done thing for me to do. Supposing the director googles me for some reason and finds this? I don't want to shoot myself in the foot! The thing is, I am so very proud to have been part of this callback process. Every single person at that callback had talent oozing from every pore. I'd accept any role to be a part of this show. Even a horse - apparently the Headless horseman's horse does flips (according to the youtube video) - I can do that! Pick me, pick me! After spending 5-6 hours with the pro team, I would be forever grateful to be part of this production with them. I am already, in-the-now grateful for them dedicating that much time to me. I, honestly, am not expecting to not be cast, but I am not expecting to be cast. If I don't get to be a part of this show in some capacity, I know there are other plans in store for me. If I do, I am going to have the time of my life with this one. The music is so hopeful and suspenseful and touching and I am definitely going to see this show no matter what happens. Have I mentioned how everyone there blew me away with their talent? Oh I have? Well, again, they blew me away and I am beyond honored to have been a part of such an unbelievably amazing audition group. Best wishes to everyone! To top it all off, I had a dream last night that they narrowed the part I am in the running for down to six girls and the musical director suggested they eliminate another girl and myself, while the director disagreed and wanted different people eliminated. Oy. I'll sleep better now that auditions are over. In short, this is the best and the worst audition I have ever had. I know I will end up where I am supposed to be (but I've still got my fingers crossed! ).